BACKGROUND AND PURPOSE: Endovascular treatment of broad-neck intracranial aneurysms with detachable coils requires special techniques. Placement of a stent over the aneurysm neck and secondary coil embolization prevents coil migration and allows attenuated packing of the coils. However, access for the stent-delivery system can be technically limited in tortuous anatomy. We present six cases of broad-neck aneurysms treated with a new self-expanding stent and coil embolization. METHODS: Three aneurysms of the supraophthalmic internal carotid artery and three aneurysms of the basilar tip with extension to the origin of a posterior cerebral artery were treated. The stent was a new self-expanding stent with a 3F over-the-wire microcatheter delivery system. Coil embolization was performed with electrolytically detachable coils. Time-of-flight MR angiography was performed after treatment in five cases. Three other patients could not be treated with the stent because deployment was not possible after correct positioning of the delivery system. RESULTS: Access with the stent-delivery system was easy, and the aneurysm neck was covered sufficiently. After stent placement, total coil embolization was achieved in four and subtotal coil embolization was achieved in two. Parent arteries remained open, and no secondary coil migration was seen. On follow-up MR imaging, the stent was clearly visible and patency of the parent vessel and emerging branches was assessable. CONCLUSION: This new stent is a safe and efficient tool for the endovascular treatment of intracranial broad-neck aneurysms. Access to smaller vessels was easy, but the mechanism of deployment had to be improved. Follow-up MR imaging was sufficient. Endovascular treatment of unruptured intracranial aneurysms with detachable coils has proved to be safe and an important alternative to surgical clipping (1–3). However, for such treatment, a suitable aneurysm is required. A broad neck with a diameter of more than 4 mm or a fundus-to-neck ratio less than 2 increases the risk of coil migration or coil protrusion into the parent vessel (4, 5) and leads to lower occlusion rates (6, 7). One possibility in treating these broad-neck aneurysms is the remodeling technique first described by Moret et al in 1997 (8). This approach involves the temporary inflation of a balloon in the parent artery at the aneurysm neck during the placement of each coil. An increasingly used alternative is coil embolization through the mesh of a stent, which is initially placed over the aneurysm neck. Thus far, balloon expandable stents like coronary stents or specially developed balloon-expandable neurostents have been used for this technique. The disadvantage of these balloon-expandable stents is their poor flexibility and pushability, which often makes it impossible to navigate the systems to a suitable position. We report our experience in six patients with unruptured intracranial aneurysms. The patients were treated with coil embolization after the placement of a newly developed self-expanding stent (Neuroform; Boston Scientific/Target Therapeutics, Freemont, CA). This stent has a segmented open-cell design to minimize branch-vessel occlusion and to facilitate catheter access through the stent into the aneurysm (Fig 1). Close-up views of the stent show its segmented, open-cell design and itspositioning over the neck of an aneurysm with catheter access to the aneurysm. We treated three patients with an aneurysm of the supraophthalmic internal carotid artery (ICA) and three patients with an aneurysm of the basilar tip with extension to the origin of a posterior cerebral artery (PCA). Treatment procedures were performed with the patient under general anesthesia and via a transfemoral approach with a 6F sheath and a 6F guiding catheter (Envoy Max ID Multipurpose 90 cm; Cordis, Johnson and Johnson Medical, Miami, FL). Patients were given aspirin 100 mg and clopidogrel 75 mg once a day orally for at least 3 days before the procedure and for the next 4 weeks. This was followed by aspirin 100 mg for 6 months after treatment. Heparin was administered intravenously after the sheath was introduced to achieve an activated clotting time of 250–350 seconds. An exchange microguidewire (PT Choice 300 cm; Boston Scientific Scimed, Maple Grove, MN) was navigated past the aneurysm into a peripheral branch of the parent vessel with the help of a microcatheter (Excelsior SL-10; Boston Scientific/Target Therapeutics). Then, the 3F over-the-wire microcatheter delivery system carrying the stent (Neuroform; Boston Scientific/Target Therapeutics) was brought up over the guidewire, and the stent was deployed to cover the aneurysm neck. In case 6, a Tracker Coil Pusher–16 (Boston Scientific/Target Therapeutics) was used instead of the stabilizer to push the stent out of its delivery system. Stents were 4.5 × 20 mm in the first four cases and 4.5 × 15 mm for the fifth and sixth cases. After successful stent placement, coil embolization was performed with Guglielmi detachable coils (GDCs; Boston Scientific/Target Therapeutics) through a microcatheter (Excelsior SL-10; Boston Scientific/Target Therapeutics) placed in the aneurysm through the mesh of the stent. In cases 2 and 5, additional Dendron coils (Dendron, Bochum, Germany) were used. A 36-year-old woman had an incidental broad-neck aneurysm of the right ICA, paraophthalmic segment. Its diameter was 3 mm, and the neck was 2 mm. The stent was placed in the proximal right medial cerebral artery (MCA) and distal ICA, completely covering the aneurysm neck. Embolization was performed with a 10–3D GDC sized 3 mm × 6 cm and one Ultrasoft coil (Boston Scientific/Target Therapeutics, Maple Grove, MN), which resulted in total aneurysm occlusion. Time-of-flight (TOF) MR angiography was performed following treatment (Figs 2–4). Case 1. Far left, Broad-neck aneurysm of the right ICA, paraophthalmic segment. 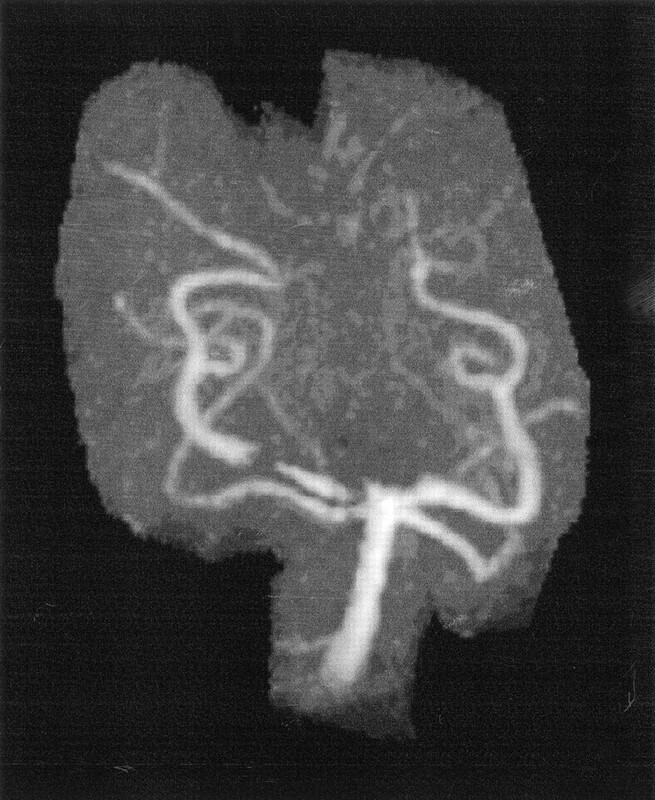 Middle left, Exchange microguidewire is passed by the aneurysm into a peripheral branch of the MCA. Middle right and far right, The stent is deployed (not visible) in the ICA and proximal MCA. The aneurysm is occluded totally with coils, as shown on the fluoroscopic angiogram (middle right) and digital subtraction angiogram (DSA) (far right). Case 1. 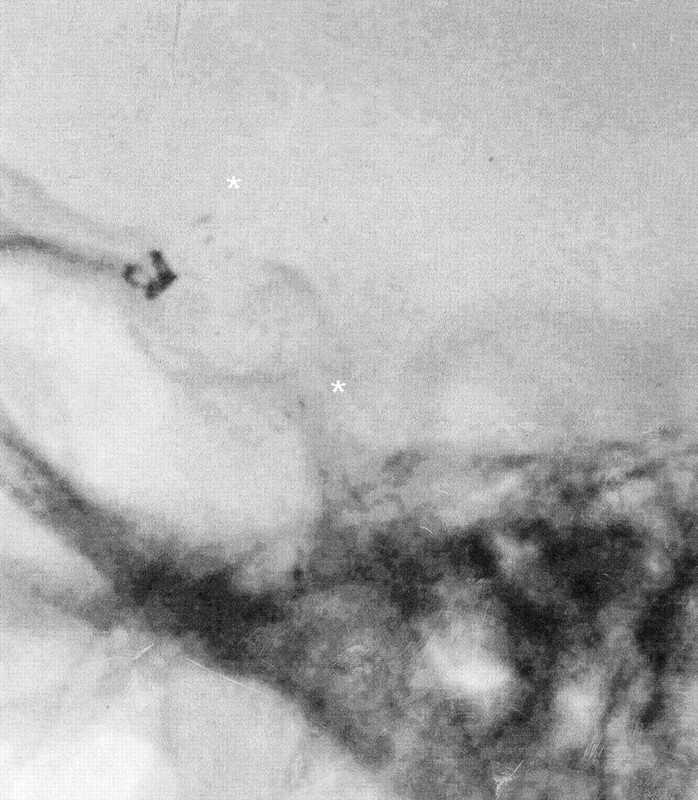 Lateral fluoroscopic view of the middle cranial fossa shows a stent in the right ICA and proximal MCA. Stent markers (asterisks) placed proximally and distally enable visualization of the deployed stent. Coils in the supraophthalmic aneurysm are seen between the stent markers in projection on the anterior clinoid process. Case 1. Left and middle, Maximum intensity projection (MIP) TOF 3D angiograms show that the stent in the right ICA and MCA does not disturb flow signal intensity. Right, Sagittal multiplanar reconstruction (MPR) of the right ICA demonstrates the visibility of the stent as a thin black line at the vessel wall. The coils in the aneurysm of the ophthalmic segment cause susceptibility artifacts. A 37-year-old woman presented with a subarachnoid hemorrhage of Hunt and Hess grade II from a broad-neck aneurysm of the right ICA, communicating segment. First endovascular treatment under emergency conditions lead to incomplete embolization. The patient recovered well without neurologic deficit and was readmitted 5 weeks later for final treatment of the aneurysm. The aneurysm was located at the origin of a fetal PCA, which remained open after the first treatment. The first coil package had become compacted, and about two-thirds of the aneurysm was embolized. The perfused part was long and flat, with a maximum length of 8 mm. Its entrance was about 4 × 4 mm, and its neck was 3–4 mm. The stent was placed in the proximal MCA and distal ICA, covering the distal half of the aneurysm neck but not the origin of the PCA. Embolization was performed with a 10–3D GDC sized 7 mm × 12 cm, a 10–3D GDC sized 5 mm × 8 cm, two 10–2D GDCs and two Ultrasoft coils, and three Dendron coils with curved tips. During attempted repositioning of the last coil (Ultrasoft coil), it was stretched and could not be completely pushed back into the aneurysm. A loop remained in the ICA, attached to the vessel wall like a ring. On angiograms, the aneurysm was totally occluded, and the origin of the fetal PCA remained open. TOF MR angiography was performed after treatment (Figs 5 and 6). Case 2. Left, Broad-neck right ICA aneurysm at the origin of a fetal PCA after incomplete coiling 5 weeks earlier. Middle, After deployment of the stent in ICA and MCA. Right, After complete coiling, a dislocated single loop of the last Ultrasoft-coil is present in the parent vessel. Case 2. Broad-neck right ICA aneurysm at the origin of a fetal PCA after stent placement and complete embolization. Left, MIP TOF 3D angiogram. Middle, Primary section of the TOF shows the origin of the right PCA. Right, Sagittal MPR of the right ICA shows the origin of the PCA and the neck of the embolized aneurysm. The stent is visible as a thin black line at the vessel wall distal to the aneurysm. A 45-year-old man presented with recurrence of a basilar tip aneurysm after SAH. Incomplete endovascular treatment with GDC was administered 3 months earlier. The perfused part of the aneurysm, about one-third of the total aneurysm, had a broad neck extending over the origin of both PCAs, moreso on the right side. A stent was deployed in the distal basilar artery (BA) and proximal right PCA, covering the neck. Embolization was performed with a 10–3D GDC sized 7 mm × 15 cm and six 10–2D coils, with total occlusion. TOF MR angiography followed (Figs 7–9). Case 3. Angiograms show recurrence of a basilar tip aneurysm. Top row, Images before deployment of a stent in the distal BA and proximal right PCA and coil embolization. Bottom row, Images after treatment. Case 3. MIP TOF 3D angiograms show the BA and both the PCA and superior cerebellar artery after treatment. The basilar-tip aneurysm is occluded with coils. Susceptibility artifacts of the coils and the distal stent markers mimic stenosis (which is not visible on DSA). Case 3. Sagittal MPR images show the BA and occluded tip aneurysm with the stent in the distal BA (a), the origin of the right PCA and SUCA (b and c), the P1 segment with the stent and SUCA (d), and the P1 segment with the distal end of the stent and the stent markers causing susceptibility artifacts (e). A 70-year-old woman had recurrence of a basilar tip aneurysm after SAH 5 years earlier. Surgical clipping of a left ICA-aneurysm and endovascular treatment of the basilar tip aneurysm with coils was performed twice, 5 and 2 years ago. MR imaging showed aneurysm growth during the last 7 months, to a diameter of 2 cm with compaction and dislocation of the old coil packages to the dome. 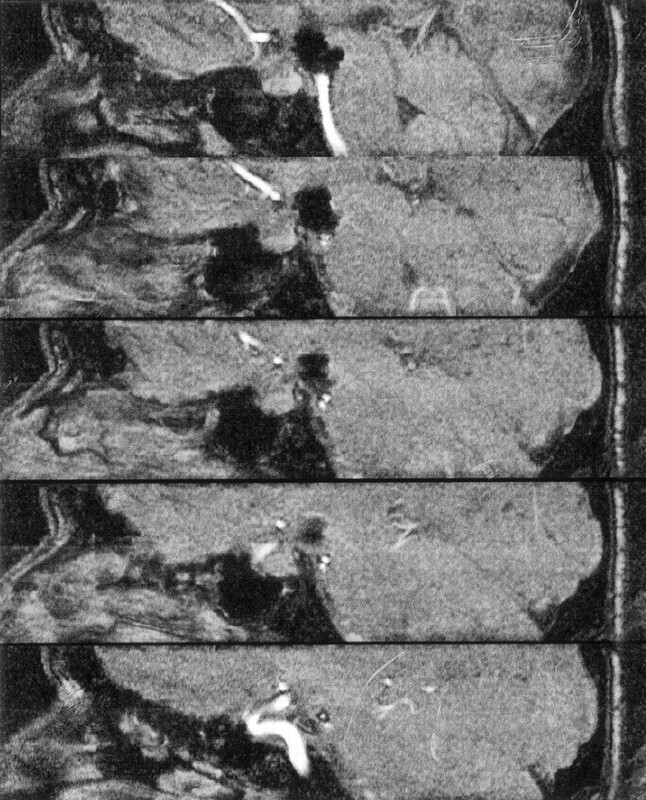 Most of the aneurysm was thrombosed, but a relatively small (4 × 6-mm) recurrence was noted at the base. The neck of this part extended to the origin of the right PCA. A stent was deployed in the distal BA and proximal right PCA, covering the neck. Embolization with total occlusion was performed with a 10–3D GDC sized 6 mm × 10 cm, two 10–2D coils, and two Ultrasoft coils. A 54-year-old woman had an incidental basilar tip aneurysm with a diameter of about 9 × 12 × 14 mm and a neck of 4–5 mm. The neck extended to the origin of the left PCA. A stent was deployed in the distal BA and proximal left PCA, covering the neck. 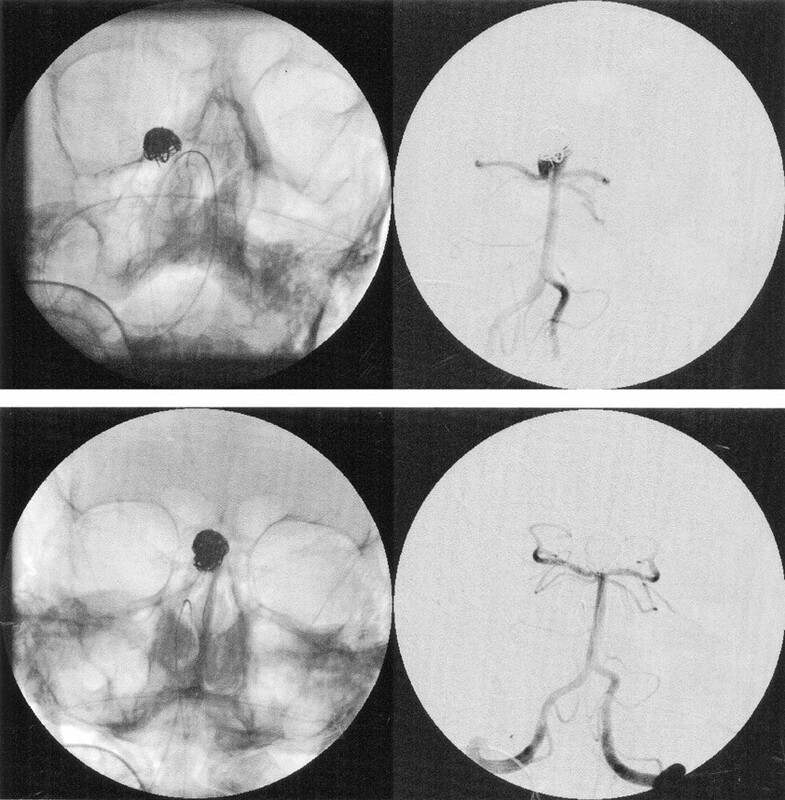 Embolization was performed with a 10–3D GDC sized 10 mm × 30 cm, six 10–2D GDCs, and three Dendron coils. Occlusion was subtotal, with a small remainder at the neck. TOF MR angiography was then performed. A 49-year-old woman had an incidental broad-neck aneurysm of the left ICA, paraophthalmic segment, with a diameter of 6 mm and neck of 3 mm. A stent was placed in the distal left ICA, completely covering the aneurysm neck. Access with the stent system and correct positioning was easy, but the stent could not be deployed initially. The stabilizer (the inlet of the stent delivery system that pushes the stent out) did not offer enough pressure in the tortuous siphon. After we replaced the stabilizer with a Tracker Coil Pusher-16, the stent could be deployed. Embolization was performed with two 10 Soft SR GDCs sized 3 mm × 8 cm, which lead to subtotal occlusion of the aneurysm with a small remainder at the neck. TOF MR angiography was performed (Figs 10 and 11). Case 6. Left, DSA of a broad-neck aneurysm of the left ICA, paraophthalmic segment. Right, The stent is deployed (not visible) in the distal ICA, the aneurysm is subtotally occluded with coils. Case 6. 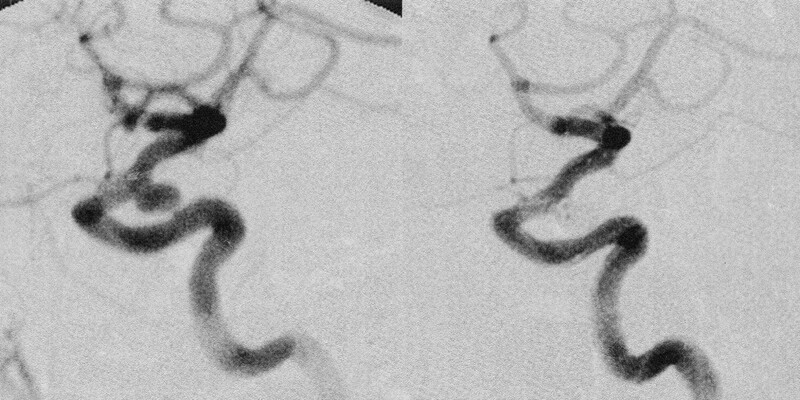 Left, MIP TOF 3D angiogram of the broad-neck aneurysm of the left ICA, paraophthalmic segment after endovascular therapy. A small remainder is noted at the neck (asterisk). Middle, Sagittal MPR. Right, Coronal MPR. Endovascular treatment of intracranial aneurysms with detachable coils has become an important alternative to surgical clipping. Several years after the introduction of this method, the reported rate of periprocedural complications has become low (1–3), allowing preventive treatment of unruptured and asymptomatic aneurysms. Simple coiling is limited to aneurysms of a certain geometry, and broad-neck aneurysms are excluded. With the help of an occlusion balloon, which is temporarily inflated in front of the aneurysm neck during the placement of each coil, some of these aneurysms are treatable. However, this so-called remodeling technique has disadvantages and limitations. A double transfemoral approach with two groin punctures or a single access with a bigger sheath diameter is needed; this results in a higher risk of local complications (9). The use of two catheters and the repeated occlusion of the parent artery also increase the risk of thromboembolic complications (10, 11). Access with two systems is more difficult, and the balloon might cause injury or spasm of the vessel wall (12, 13). The limited occlusion time with the need of repeated reperfusion prolongs the procedure. Finally there is a risk of secondary coil migration (unpublished data, current authors and V. d’Isère, 2002). An alternative is the placement of a stent in the parent artery to cover the neck of the aneurysm. So far, small, flexible balloon-expandable stents like coronary stents or related neurostents have been used (13–19). The stent itself reduces aneurysm inflow (20) and might thereby induce stasis and thrombosis with occlusion of the aneurysm (21). In combination with embolization using detachable coils, the stent serves as a scaffold that prevents coil herniation. A stent may also provide an endoluminal matrix for endothelial growth (22, 23). An additional hypothetical argument for using stents to treat aneurysms is that they fill in the hole in the vessel wall and heal the vascular disease in the long term. The Neuroform stent is a new self-expanding microstent that is deployed via a 3F over-the-wire microcatheter delivery system. The small diameter and high flexibility of this system allows access to smaller intracranial arteries, even in tortuous anatomy. The segmented open-cell design allows the mesh of the stent to open wide at the outer curvature of a sharp curve, which minimizes branch-vessel occlusion in T-shaped bifurcations such as the carotid T or the basilar tip. The stent also has low stiffness that does not straighten or deform curved vessels or bifurcations. Because of the low radial force of the stent, which is close to the physiologic radial force of the intracranial arteries, vessels with a diameter smaller than the nominal diameter of the stent are not dilated by the stent. Therefore, it is possible to place a stent in the carotid siphon and the M1 segment or in the basilar artery and the P1 segment. Our cases demonstrate the use of the Neuroform stent for endovascular treatment of unruptured intracranial broad-neck aneurysms. The stent prevented coil herniation into the parent artery or the nearby branches. In case 2, the last coil was stretched during repositioning, and a loop remained in the parent artery. This complication can occur with all coil embolization techniques. Apart from this active coil herniation, no herniation or secondary migration was seen. In addition to the six patients reported herein, we intended to use the stent in three other cases. Despite easy access, we had difficulty with the deployment of the stent in these cases, which involved elongated siphons and supraophthalmic aneurysms. The distal end of the delivery system was bent in the knee of the siphon. Because of friction, it was impossible to move the stent inside its delivery system. In five of our six cases, there were no difficulties with access or deployment. In case 6, which involved an aneurysm of the paraophthalmic segment of an elongated ICA, stent deployment was difficult. We used a coil pusher instead of the original stabilizer of the delivery system. The coil pusher allowed a higher pressure to overcome the friction in the delivery system. The manufacturer has since changed the delivery system, replacing the former microcatheter with a braided catheter to reduce friction. Patients 1, 2, 3, 5, and 6 underwent MR angiography following endovascular treatment. Cases 1–3 demonstrate the good visibility of the stent and the stent lumen on MR imaging, especially TOF angiography. Only the proximal and distal stent markers caused relevant susceptibility artifacts that might mimic a stenosis (Fig 8). The other parts of the stent were visible as only a thin black line along the vessel wall. In our cases, the coil package in the aneurysm caused few susceptibility artifacts, as described in other reports (24, 25). Concerning the artifacts, no difference was seen between GDCs and Dendron coils. Despite the combined artifacts from coils and stents, small remainders of aneurysm (known from DSA) were still seen in cases 5 and 6. Patency of the parent artery and emerging branches was assessable; follow-up MR imaging was sufficient. Because of the small number of cases, the possibility of the stent causing more artifacts in a special position in the B1 field or in a different position in the adjacent tissue (possibly containing bone or air) cannot be excluded. In our cases, unruptured broad-neck aneurysms were treated. Patients were prepared for endovascular stent treatment with antiplatelet medication over 3 days. Stent placement always poses a risk of acute in-stent thrombosis. This complication is well known from extracranial vascular territories, eg, the coronary or carotid arteries. Sufficient premedication with two antiplatelet drugs has successfully reduced the rate of this complication. We also recommend this medical regimen for patients undergoing intracranial stent placement. In the treatment of acutely ruptured broad-neck aneurysms, we avoid using a stent without sufficient premedication. Alternatively, treatment could be divided. In a first approach, the aneurysm dome is embolized with coils to prevent rebleeding. In a second approach after antiplatelet medication, stent implantation and coil embolization of the aneurysm neck are performed. The stent is used in an acute situation only if this alternative is not possible. Afterward, heparin and acetylsalicylic acid are given intravenously (In Europe, aspirin for intravenous injection is available. ), followed by the usual medication described earlier. The Neuroform stent is a safe and efficient tool for the endovascular treatment of intracranial broad-neck aneurysms. Access to smaller vessels is easy, but stent deployment is difficult in some cases; the manufacturer has since improved the delivery system. Follow-up MR imaging was sufficient in our cases. Further work is necessary to investigate the possible influence of stent positioning and stent environment on MR artifacts. We would like to thank Mr Thorsten Mahn (Boston Scientific GmbH, Europe) for the pictures of the stent. Accepted after revision September 23, 2003.